You cannot see what I see. You cannot feel the emotional weight of this room, or know the significance of that cushion, made by a friend and stuffed with secrets. You do not know the impact of that brocade throw, treasured by my mother and trashed by the dog in in a fit of pique which apparently involved a biscuit. The view is distorted, not only by the convex mirror, but mainly by the emotional content. Emotional content distorts all our views, much of the time. 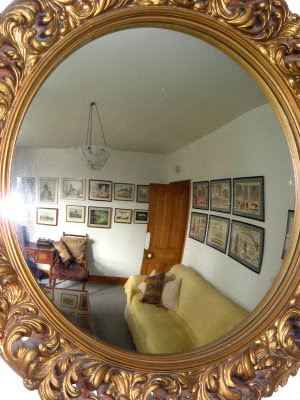 Sadness, anger, joy, guilt, depression, contentment; the whole gamut may act like this convex mirror, changing the shape, emphasising some aspects, pulling things into different places. For many years I have been trained as a listener: first by 'Samaritans' and now by 'Cruse'. Listening, real listening, is a huge privilege. Sometimes you are invited through the mirror, like Alice, to enter the distorted world beyond. Sometimes, quite often, it is not right to do this. Sometimes, more often, it is wiser to stay side by side, looking into the mirror and trying to understand the distortions. Being listened to is wonderful. It frees the mind and the heart, and opens possibilities. People do not want advice. (Correction again: if they do, they generally know where to go to find it.) They want to be heard. One of the more frustrating experiences of Samaritans (who are very carefully and specifically trained not to give advice) is to be thanked by a caller for all the advice. People advise themselves when they are truly heard. They are given the time and attention to talk through the emotions and the distortions and to clarify their thoughts. They may want to keep their distortions, and that is their privilege, too. Some distortions may be more comfortable to keep than to try and change, but it's good when being heard helps you to see that you're doing just that. Listening is both wonderful and exhausting, which is why organisations like Cruse and counselling services, generally only offer it by the hour. It doesn't have to take an hour, though. Sometimes ten minutes is enough to help someone out of a bad patch and to slightly improve the view. The other day I was moved to hear a friend simply and eloquently describe her listening skills as ' to listen to the story, to feel the pain, to see it through'. We can look into one another's distorting mirrors and try to see. Ah. Very moving, RR. Yes indeed, an undervalued and precious skill, the ability to really focus, really listen. I have no doubt that you possess it. And what a good choice of photograph. mm: Thank you, too. The Box might be another story, but I think Zhoen has already done it! A good skill to have. I hope the 'listener' also has someone who will listen to her too. HHnB: A good point. Samaritans 'off-load' before leaving their duty, and Cruse volunteers are under regular 'supervision'. Both organisations require on-going training, so volunteering is quite a committment. I hope I don't give the impression that I can 'do' this. When not in volunteer mode I can easily bore the ears off anyone who will give me a chance! I have a couple of friends who, when I (occasionally)offload various worries to them, will offer advice when all I want them to say is: oh dear, what a shame. Their advice isn't really relevant since I haven't told them the whole, detailed story. Every day I sit listening to my mother pouring out her worries (about the grandchildren, the economy, her roof, the neighbours...). I hope that it helps because it certainly depresses me very efficiently! RR you show great wisdom and insight, and this was a post which truly reached my emotions. Listening indeed is so valuable. I have just come through a year's intermittent "listening" which has clarified my thoughts, reactions and responses, and enabled me to start making better decisions and responses and to focus on what I want to achieve. I am glad the organisations allow the volunteers to be debriefed. Isabelle: Thank you. The room stays tidy most of the time now that it's just me around. Sad, when I think how I moaned about untidiness a few years back! I'm sorry you have to put up with that every day. Can you impose any sort of time limit? Persiflage: Thank you for your kind comment. I'm so glad that you've been helped by this sort of service. The de-briefing is essential for clients and counsellors, and it helps to create consistency in the service. Your words settled like pieces in a puzzle. Thankyou for that. Den: Thank you; that's a lovely thing to write. I'm glad I found you, too. I read this last week sometime and wanted to comment, but so many different things came to mind I couldn't organize my thoughts. Anyway, lovely resonant post. I often look around my apartment and remember who gave me this or where I was when I bought that. So many stories wrapped up in the things we keep around us. You're right about the need to be listened to. No doubt it's also why some of us blog - to express ourselves and, if we're lucky enough to have regular readers who comment, be "listened" to. Leslee: Thank you for the comment. Yes, it was a very unexpected plus for me, to discover that there are friendly and caring readers whose perceptive comments really do provide a listening ear. R.R., I do like the way you've taken two apparently unrelated ideas - a distorting mirror, and listening to people who need to unburden themselves - and woven them into a single, thought-provoking whole. It takes a lateral thinker to recognise the parallels between them. I don't think I would have seen the connection. Peregrina: Hello and thank you. You'd be amazed what I come up with when I'm face down in the herbaceous bed! Seriously, the freedom to follow a train of thought is an advantage of living alone. Sounds as if being bottom-up in the herbaceous border helps you get down to the bottom of things! Like Leslee, it's taken me a while to mull this over. Not because I disagree with anything — on the contrary, having been lucky enough to have had some rudimentary training in listening, I agree wholeheartedly — but because I really don't know how to respond (thereby demonstrating, I suppose, just how rudimentary my training was). I do know that remarkable feeling when, having responded appropriately to someone who desperately wanted to be heard, that person has lit up with gratitude at finally being understood. The reward is astonishing — and scary. Given you've been doing this for many years, I truly hope (and trust) you've enjoyed similar rewards, and that you haven't become used to them. [And I loved the introductory remark about the dog's fit of pique. I laughed out loud). P.Pete: Being trusted enough to be given glimpses into someone else's life is such a privilege. You know that. Not everyone needs training. In fact training can only enhance what's already there. You know that too! This old lady dog has attitude, and can sulk and flounce with the best. I think you'd be highly entertained. Peregrina: not only bottom up, but also thoroughly senior. I just had to delete a thoroughly gluteus maximus comment which I left for the wrong person (sorry, Persiflage, if you saw it!). Thanks for listening with your eyes and encouraging. Den: thank you again - you have such a great turn of phrase. Encouragement really works, doesn't it? I hope you're enjoying your blog. I certainly am.